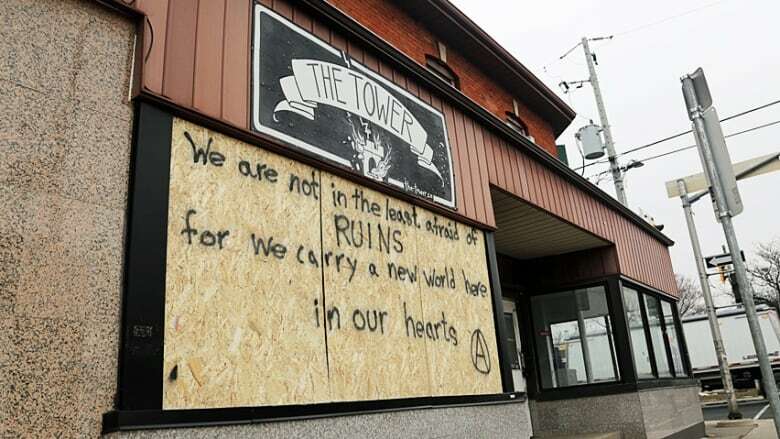 The city’s local anarchist social centre, The Tower, has been vandalized. The city's local anarchist social centre, The Tower, has been vandalized. 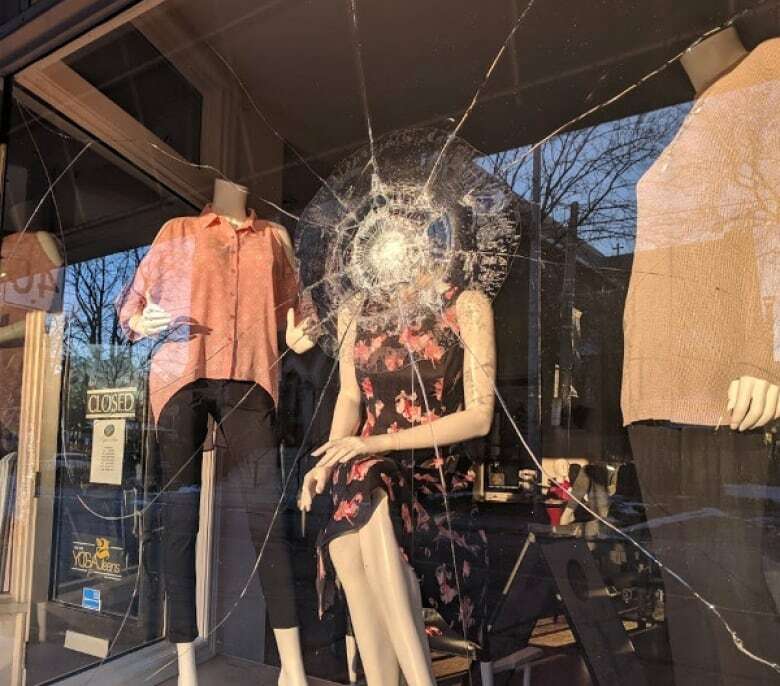 The damage comes days after a masked mob that dubbed itself "The Ungovernables" caused $100,000 in damage during a vandalism spree on Locke Street. A person who answered the door at The Tower Wednesday morning declined to be interviewed, but said the building had been broken into overnight. He said the door of the building on Cannon Street East near Victoria Avenue North had been smashed in. Nothing was taken, he said. 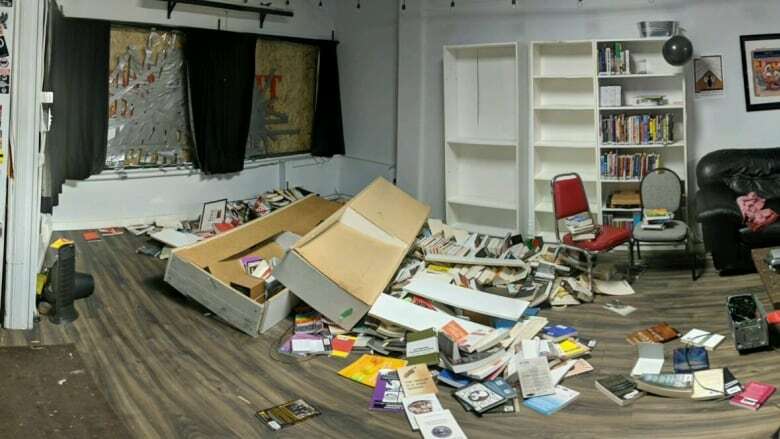 In a message on the organization's Facebook page posted Wednesday morning, the group said "far-right goons" broke in and trashed The Tower's free community library. The group also broke its silence on Saturday's incident on Locke Street. "No, the actions on Locke and Aberdeen on Saturday night were not organized by the Tower, but yes, we support what happened and are in solidarity with those who carried them out," a post on The Tower's Facebook page reads. "Class war is happening every day in this city, with constant attacks on poor and working people. It's disappointing that so many only care about the occasional moment when a bit of anger flows back the other way. "The ongoing effects of gentrification in this city are heartbreaking — waves of displacement, growing violence, and intensifying poverty. You cannot expect for all of this to just be swept under the proverbial rug. We have zero tears to shed for Locke st."
The group goes on to say that it feels a family being evicted because of gentrification is far worse than the destruction of property on Locke. "And the level of outrage is particularly despicable considering that there have been two random stabbings of women in the last few days as well. It's beyond disgusting to see conversations about artisan donuts being prioritized over conversations about violence against women." The Tower's front window has also been covered up with plywood, and painted with the phrase "We are not in the least afraid of ruins, for we carry a new world here in our hearts." The message is paraphrased from a quote by Buenaventura Durrutia, who was an integral figure in Spanish anarchism around the Spanish Civil War. Hamilton police Const. Lorraine Edwards confirmed that the break in happened around 3:30 a.m. Wednesday. She said that a concerned citizen in the area called 911 after seeing or hearing something suspicious. "The front door was ajar upon police arriving and items inside the store (books and shelving) was scattered across the floor," she said in an email. "Police are continuing to investigate. Police will follow up with any leads which may involve the concern for further retribution." Investigators announced Tuesday that they have linked an anarchist book fair held at a Hamilton high school over the weekend with the incident on Locke Street Saturday night. At a news conference yesterday, Staff Sgt. Mike Cunliffe refused to say what that link might be. "I won't speak directly to the evidence," he said. Around 10 p.m. ET Saturday, about 30 people dressed in black with their faces covered started setting off fireworks in the Kirkendall neighbourhood in the city's southwest, police said, and also damaged vehicles and threw rocks at store windows. Several businesses on Locke Street were targeted. One of them was Pippa and Prue, owned by Allison Prudy. She told CBC News on Wednesday afternoon that she doesn't understand why Locke Street should be the focal point of a conversation about gentrification. "So we just want tattoo parlours and run down buildings? Is that what we want?" she said. 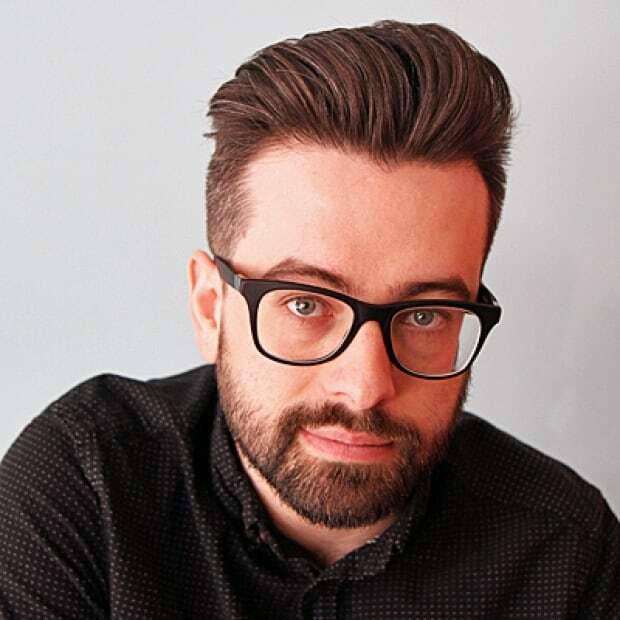 "[The area] needs to be fair for all, but I just think they picked the wrong neighbourhood. I think everyone wants a nice neighbourhood to live in, and we live in a place where that's possible. "I don't think they're informed, the people who did this. I think they're hooligans."